B2evolution version 6.11.0-beta adds Webmentions support for Indieweb. This is a great addition to an excellent CMS. Things I learned on Twitter file: Actress Honor Blackman was a motorcycle dispatch rider during World War II. Per: Tweet with photo Ms. Blackman known for her roles in The Avengers TV series and James Bond movie. Anyone who thinks there is one simple answer or solution to each of the great problems facing our society is delusional. Treating the symptoms does not address the underlying causes. I’ve been trying to remember how I first heard about Micro.blog and – nothing. I remember looking at the site, I remember signing up, but not how I found it. “Stranger Things” TV series looks really good. I don’t have Netfix so I’ve never seen it and I’m not subscribing to Netflix just for one show. Okay, so I’m sitting here wondering if vampires can withstand the sound of bagpipe music. I spent some time last night reading reviews of the iPhone XR and inspite of all the slobbering superlatives in those reviews, nothing convinced me to go back to an iPhone except the improved privacy over Android. Access to Apple Pay may also be a factor because I trust Apple Pay over Google Pay. The rest was bigger, faster, longer, more cool and do what Apple says and what Apple wants. No innovation. And again, the Apple walled garden is everywhere: “not compatible with existing micro-SIM cards” which means I can’t switch back and forth between an Android phone and the XR. Use Apple’s Safari browser or pound sand. Use our proprietary cords. iOS 12? Boring. Again, bigger, faster, longer but still the same old iOS. Price? Cheaper than all the flagship phones but still a lot of money for a phone that does not have fingerprint ID. Screw that. 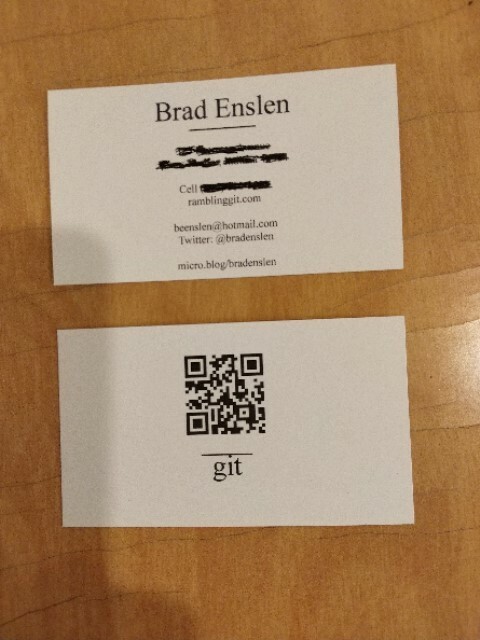 I have business cards, they advertise the business I’m a partner in. They don’t advertise me as an individual. Every once in awhile I run into somebody socially who wants my contact details, not business but about me. So I thought I would get cards that represent just me. This is nothing new, people used to have calling cards or visiting cards and the Victorians, in particular had elaborate rules of etiquette surrounding their use. Calling cards were important in an urban world before telephones and internet and at a time when many servants may well be illiterate. The business card evolved out of the calling card. Anyway, it would be accurate to call what I ordered calling cards. Normally I leave the back blank, so I can write on it, but the design I chose called for a logo, which I don’t have. However, I could substitute a QR Code which will take people to my blog if scanned so I used that. Still enough room to jot a note. The printer offered a bewildering choice of card papers, I chose cards made from 100% cotton sourced from scraps in the making of T-Shirts. No trees. I like the idea of having a QR Code somewhere on the card. I personally don’t use them except when exhibits have them, like at an arboretum or a museum, but others might so no harm in having it there. That’s it - Me Cards. I don’t need them often, but darn handy when I do. Interesting. This, The Justwrite Post came up on my Twitter feed. Fountain pen users might be interested. For the last couple of years about the only thing I write in cursive with a pen are checks. Otherwise it has all been keyboard typing. Writing anything at length with a pen is like relearning how to write. Fortunately, like riding a bike, it comes back quickly. Writing with a fountain pen brings it to a different level. More arm, less wrist and fingers and different angle. Or something. Which makes me wonder if writing with a fountain pen, might be good exercise for preventing carpal tunnel? Dunno. I wanted a cheap fountain pen to carry everyday because pens I carry have a habit of getting lost. This pen generally sells for under $10 and you can even buy 4 pens for under $20 if you shop around. Even though each pen comes with a converter for bottled ink, I also ordered some Jinhao black International Standard sized ink cartridges. International Standard sized cartridges are available from other manufacturers and they should work too, so you are not locked into a proprietary ink cartridge. I like that. The X750 has a medium nib which is a bit more fine than my Pilot. The X750 uses a common #6 nib so you can upgrade it. Got pen, installed cartridge. The cartridge is very rigid so you can’t squeeze it to start the ink flowing so you have to do some jabs to start off. Once I got the ink going there was some dripping but I just test wrote through it and the flow seemed to settle down to a normal flow in a short time. 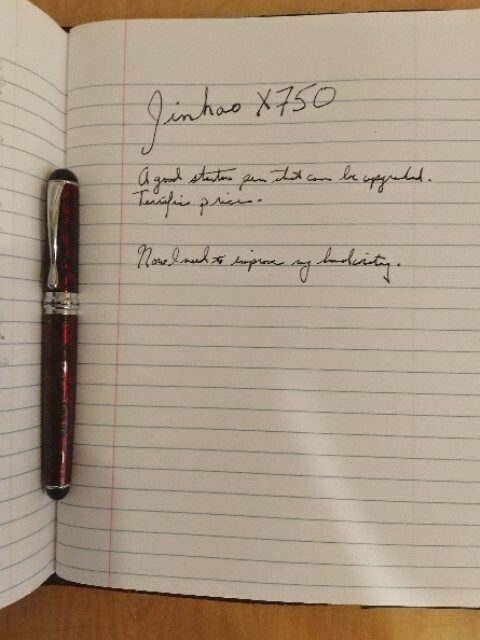 Then I wrote a journal length test page, and the Jinhao X750 wrote very well. Some small skipping every so often but nothing to put me off. It writes more like a $20 pen and does not feel cheap. This could be a good starter pen if you are on a budget. My Pilot Metropolitan glides a little bit better with a slightly broader line, but my first impression is I could write all day with the X750. The ink cartridges themselves seem sturdy. One complaint about Pilot cartridges is leakage during shipment. The Jinhao cartridges look and feel like they might take more abuse in a padded mailer envelope. They are reasonably priced. The ink flows well and gets the job done. In my limited test I have no complaints. My observation is the black is more translucent than black Pilot ink, but it writes just fine. Here is a professional review of the Jinhao X750 by Goulet Pens. You can find Jinhao pens from various online pen retailers like Goulet (above) and also on Amazon and eBay. Keep in mind, I have not started to carry this pen everyday so I can’t speak to things like leakage yet. I don’t even know if I will like carrying a fountain pen. I’ll update when I know.